This post is a little long because there is a lot of info. Stick with it to the end for a DIY tip. Before I became a decorator, I thought my only recourse to “stain-proof” upholstery was to buy dark colored fabric with some sort of dense pile. Hence, I have two enormous, 11-year-old brown corduroy sofas in our barn room (i.e. the family room/play room over the garage in our attached converted barn). They’ve done pretty well, but even those monsters show old spit-up stains I was never able to get out. Fast forward a bunch of years. We moved into this house. The corduroy furniture stayed but moved out of sight. I had a space for a library/music room and wanted to decorate it right, with furniture and style that would stand the test of time. I was done with brown corduroy. I wanted PATTERN and PRETTINESS. I knew we’d use this room a lot, and many items are very durable, but I didn’t think we’d really be eating or drinking in here so I wasn’t too worried about stains. Even if I were, I didn’t know (back then) how to protect beautiful designer fabrics. As it turns out, the Handsome Husband and I eat at least 3 dinners in here a week, and forget about the copious amounts of wine drunk in front of the fire. I try not to be too paranoid. Life happens, right? And hindsight is 20/20…. That being said, the performance fabrics these days really are pretty d*** amazing in their stain battling abilities. Moreover, some you would swear were linen, silk velvet, even mohair. And while most are solids, companies have more and more patterns coming out every day. But let’s face it, the most gorgeous patterns are not to be found in the performance fabric lines. For example, this house was featured in Southern Living not too long ago. I loved the living room. 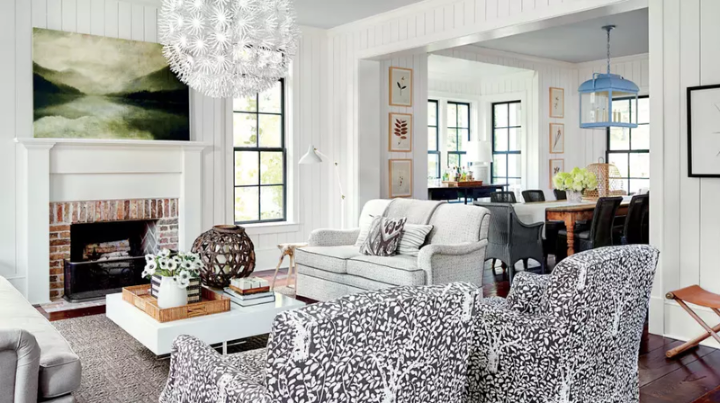 It looks casual and family-friendly because of the high-low combo — Ikea chandelier and China Seas’ Arbre de Matisse Reverse Brown on Tint fabric on the club chairs — and the more farmhouse features like wide-plank floors, natural rug, and shiplap walls. But I tell you, with the cost of that China Seas fabric, someone would be crying BIG TIME if wine spilled on it. So…how did the designer dare to do it? Have the factory pre-treat the fabric — For additional $, some fabric companies will apply teflon or Nano Tex finishes. Teflon provides an invisible shield around a fabric’s surface. This finish protects fabric from water and oil based stains and prevents airborne dirt from settling in amidst the fibers. Nano Tex, on the other hand, fuses with the fibers on a microscopic level to create a barrier. Not every fabric company has this option. 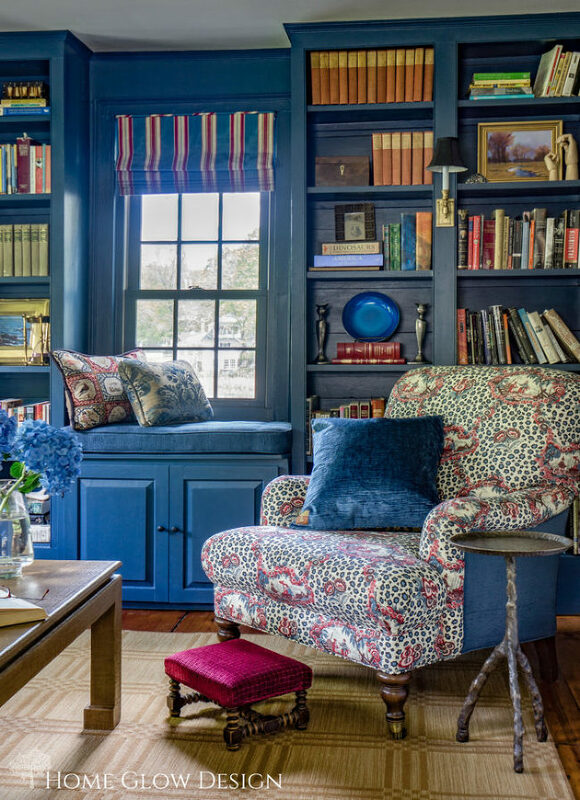 Send the fabric out to be treated prior to being used on upholstery — I have an environmentally-friendly company to which I send many of my fabrics out for pre-stain treatment (including for oil-based stains). This company also does my anti-microbial finishes, vinyl lamination (think kitchen banquettes! ), and knit or acrylic backing when I need it if the original factory doesn’t provide the option. They are absolutely awesome! Were I to specify some Abre de Matisse for a client, this is the option I would choose. Have the fabric treated once the upholstered items are in place — There are various companies that will come out to your house and professionally spray your furniture with a sealant on site. Back to the story of my library chair. I didn’t know about stain-pretreatment before I got in the trade, so that gorgeous Brunchswig & Fils Leopard Toile was never protected. I eventually learned about various upholstery treatment companies in the Boston Metro area, but I lived way too far from their area of service to be able to use them. I belong to a few Facebook groups exclusively dedicated to designers. I kept hearing about this one company, supposedly nationwide, that got simply RAVE reviews from decorators whenever anyone asked about onsite stain protection — Ultra Guard. That settled it. I decided to call. Is guaranteed to be permanent even through professional cleaning. 5 year Service Warranty Available with money-back guarantee. Sounds too good to be true, right? Well, the warranty made me feel like taking the plunge. BUT, there actually was a service rep in my area, so I took that as a sign. I had it done. Let me show you what it is like. There goes my chair! Yes, there was a bit of an odor — not unpleasant, just a little sweet, and gone pretty quickly. And one of my sofas! The product is not supposed to harm any other furnishings (and is actually used to treat rugs), but reps always put down plenty of drop cloths, nonetheless. I let everything dry for a day. Then, to be sure that my toile chair hadn’t yellowed, I pulled out a remnant I had left of the original fabric (which I have kept dust free in tissue paper and a plastic bag). I think that looks pretty darn good. Done, right? Not so fast. There are 2 twists to this story. Firstly, I’ve had these sofas for 3 years without any stains. However, earlier in the week, before the Ultra Guard service visit, my cleaners came. I asked them to give the upholstery a quick vacuum, and they did. Only, I think they cleaned up the FIREPLACE with the same vacuum first. That black stuff was ground in. It looks like the fibers had actually been altered, but I hadn’t even noticed it yet! Ken found it. Ken used his stain-whacking skill and was able to remove almost every sign of stains and then seal the cushions with Ultra Guard’s Stain Free. Following this, my dog came and stuck a wet gooey rawhide in between the cushions (again, unbeknownst to me) until I found it crusty and hardened on the fabric the next day. I don’t even know where she got the rawhide — she usually chews on her bone. Seriously, my poor sofas!!! I was afraid of making it all gooey again, and the only info I could find on cleaning rawhide off upholstery was to do your best by scraping it off with with a butter knife. So I got to see Ultra Guard’s Stain Free in action. Ken came back, and worked his magic. Thank goodness I’d just had them pre stain-treated. Talk about a serendipity. This was completely unplanned. Now, having your furniture professionally treated isn’t cheap (though it’s cheaper than crying over a ruined $2,000 sofa). If you can’t go that route, Ultra Guard does offer a DIY spray. I couldn’t have all my furniture professionally done, so I got a bottle in order to treat a few ottomans (2 white ones) and a bench I have. 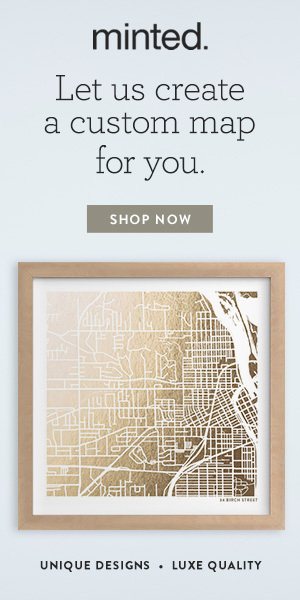 Now, no way in h*** am I going to dump oil and wine on my furniture on purpose, no matter what guarantees are made or what kind of sensationalist blog post I’m trying to write! But I will try them out on some of my fabric samples! IMPORTANT POINT: Not all stains will bead up on fabrics, even with treatment. Beading depends on the surface tension of a fabric, so tighter weaves will bead better. The Stain-Free polymer surrounds the fiber so that a stain residue can be cleaned professionally if need be for particularly tough stains. Ultra Guard’s guarantee is that it will dramatically reduce the chance of a stain being permanent. Right, so I first tried the DIY spray on a fabric with a lower surface tension — this stunning, linen-cotton blend by Clarence House that looks hand painted. As expensive as it is wholesale, your jaw will drop when you see what the price is here. I pretreated the fabric and let it sit overnight. Then I spilled ketchup on it. Blotted up the excess, but a lot stayed in the cracks between the linen basket-like weave. I used water and a secret weapon I’ll reveal in a minute. Then I brought out the red wine. See how it doesn’t really bead up on this looser fabric? My secret weapon is Biokleen’s Bac-Out Stain and Odor Remover. I found out about it when I cloth-diapered my two boys for their first two years. Only time I ever went searching the Mommy blogs for info, but it works well on dirty diapers, so why not other stains. The ketchup stain took some work, but it came out. The wine stain was much easier. Next I tried something with a higher surface tension but a lighter color. This Pindler fabric is great — super soft touch, a little texture, huge rub count so very durable. However, Pindler does not offer any fabric treatment options at the factory. Once again, I treated the fabric and let it sit overnight. Then I brought out wine and OLIVE OIL. I have tried Bac-Out on oil stains on untreated fabric before, and it doesn’t get the stain out. It’s only for water-based stains. The wine just beaded up. In fact, some of it rolled over to the right and off the sample! Simple blotting took care of almost everything. A little water got that last smudge out. This stain took some work, and I did use Bac-Out as well. Still a little of the stain left in the below pic. It took some effort, I won’t kid you, but with a few repeats of water and Bac-Out — I can’t see any stains, can you? 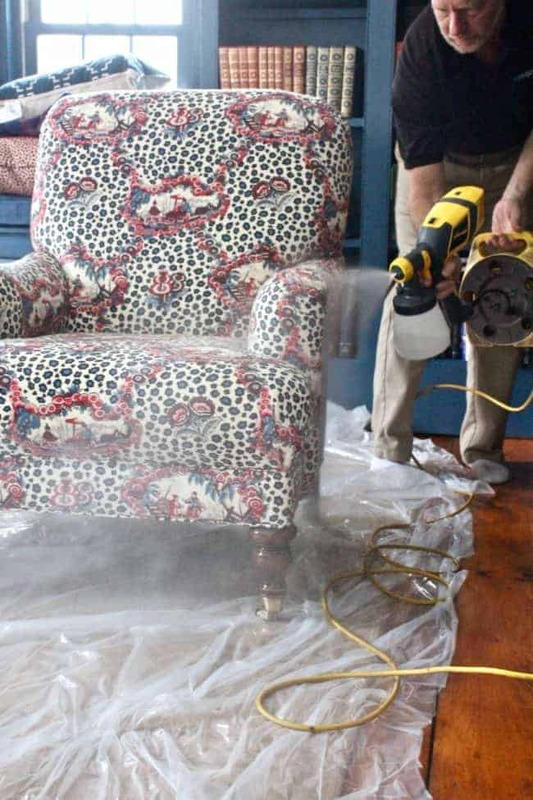 My opinion — if you can swing it, it’s totally worth the cost to have the professionals do the heavy duty, get-into-every-nook-and-cranny, get-the-warranty spray job, especially on any light colored furniture. However, if you can’t do that (or don’t want to do it for your whole house), buy a couple bottles and do the items you’re most worried about. Some stain protection is better than none! And at $30 for a bottle to cover an 8-foot sofa, the cost is well worth it. Any questions? Any thoughts? Any stain horror stories??????? Seriously, I thought I was gonna die when I had two major stain episodes in a single week after 3 years of living cleanly. A graphic for you to pin if you are so inclined! I’ll see you next Saturday with … not sure yet. But if you’re dying to have me explore something, let me know! ***Thanks to Ultra Guard who sponsored this post. All opinions and words are my own. Thank you for supporting the sponsors that allow me to continue to bring you original content. I am so impressed by this product and its effectiveness on stains. I will definitely be recommending it to friends and trying it myself! I look forward to reading your posts every week….your’s is one of the best blogs out there in my opinion. Keep up the good work! Just wondering if you have ever written about the best wall to wall carpeting. I know it’s not a popular product these days, but for those of us who still prefer it in bedrooms, it could be very helpful. Thanks, Paula! It really seems like a great company with a great product, just not much of a marketing machine.